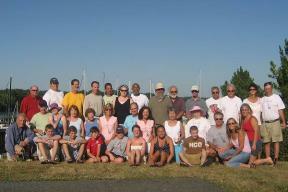 This year’s Fleet 10 East Coast Cruise was organized by one of our long time fleet members, Augie. 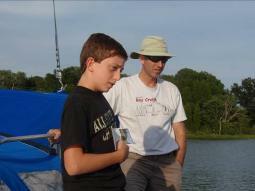 The cruise was suggested by his son, Augie IV, during last year’s cruise. Augie IV proposing the itinerary for this year's cruise, with Augie in the background. I was a little sad meeting the fleet at the marina because I couldn’t have my boat, Key Largo, there for the opening of the cruise. 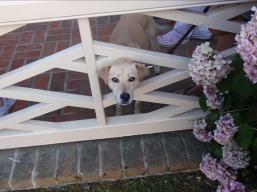 I had been called for jury duty and was near the end of a trial that I had been selected for. 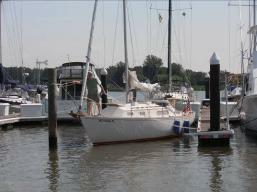 I had to drive from our marina around the upper end of the Chesapeake Bay to Rock Hall to meet the fleet. My mind was still on the trial for the long drive from Middle River on the western shore to Rock Hall on the Eastern Shore, and wasn’t really thinking too much about the cruise, until I walked down the dock at Osprey Point and saw all of the C-22s and other boats from our fleet there. There were a total of 16 boats on this year’s cruise, 7 of which were Catalina 22s. 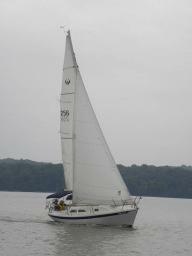 Other boats on the cruise included a Catalina 250, two 26s, two 28s, a Catalina 30, and a Catalina 36. The fleet's C-22s at Osprey Point Marina. Tom and Gina opening the present. 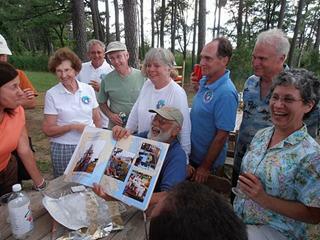 Tom showing the book of Fleet 10 Memories. 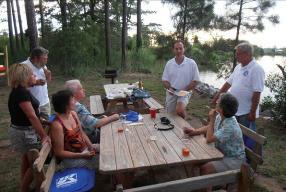 The Opening Picnic at Osprey Point Marina. Since I didn’t sail my C-22 to the opening picnic, I had to spend the night on my son Dan’s C-22, First Draught. 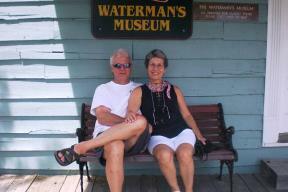 He and his mother sailed it there, and they continued to sail together until I met them later in the cruise. Dan and Alice loading First Draught with Key Largo in the background. 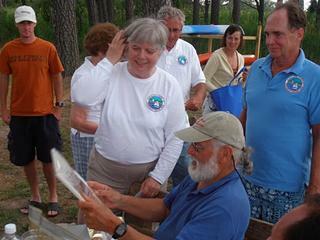 On Sunday, June 26, the fleet rafted together outside of Still Pond. 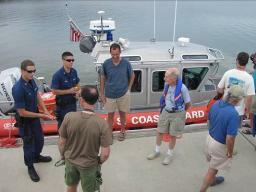 Augie had arranged for a tour of the Coast Guard’s boat. 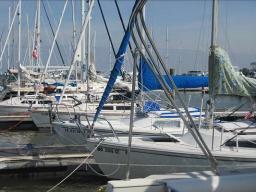 The fleet dinghyed ashore and met on the Coast Guard’s dock. 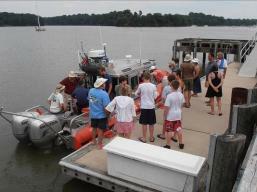 Two members of the Coast Guard answered questions from the fleet members about their boat and their work. 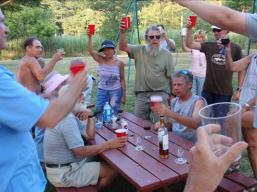 On Monday, the fleet sailed from Still Pond, to Veasy Cove on the Bohemia River. This is a distance of only 15 nautical miles, but it took many more miles to sail that distance because it was into the wind, and probably into the current. 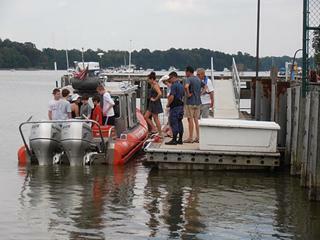 Several of the boats from our fleet got too close to Aberdeen Proving grounds and sirens were sounded on the patrol boats. 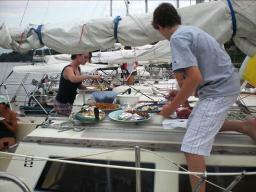 The fleet rafted together again at Veasy Cove, and had dinner on the bigger boats of the raft. 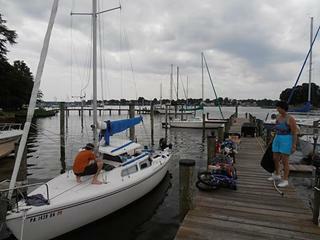 Most of the fleet explored the small town of Chesapeake City during a rain storm. Dan and Alice on First Draught, and Heather and Carol on Yes II, decided to continue on to Delaware City at the eastern end of the canal. They watched the weather radar on Dan’s computer and stayed ahead of the storm until they were almost at Delaware City. 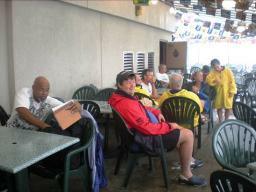 They enjoyed lunch at a restaurant in Delaware City where it rained hard for several hours. 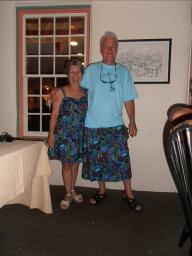 The waitress kept showing them the weather radar on her cell phone, while they ate and drank, until the storm passed. 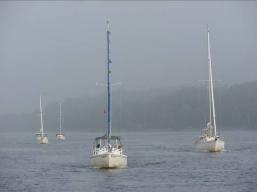 Members of the fleet after the rain in Chesapeake City. 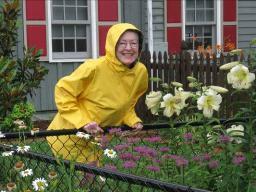 Pat checking out a garden in Chesapeake City. 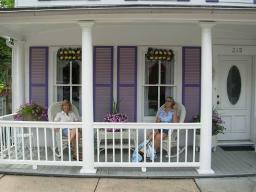 Lori and Barb relaxing on a purple porch. 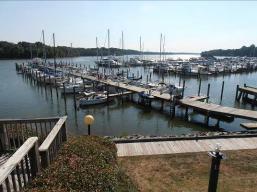 Morning at the Chesapeake Inn Marina. The trial that I was on wrapped-up on Monday afternoon. 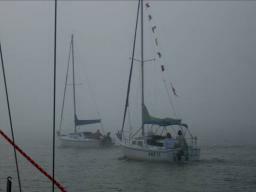 On Tuesday morning, when the fleet was sailing in the fog, I packed a few clothes and some snacks, then drove to my boat, passing through some light rain. When I got to my marina, I loaded things into my C-22, Key Largo, and left the slip at 1:17 PM. I reset the trip odometer on the GPS and connected the autopilot. 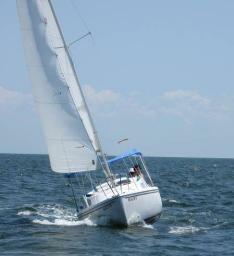 The sun was out and there was wind at my slip, but very little wind on the bay and I was heading straight into it. Even so, I was making 5.8 knots according to the GPS. 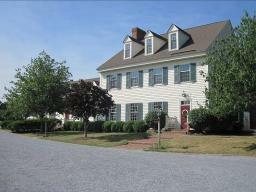 I had a long way to go to meet the fleet either at Chesapeake City that evening, or Havre de Grace, the next morning. 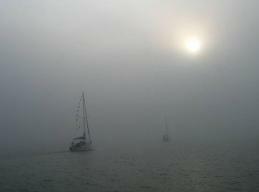 I wore my life jacket with a line tied to a jackline that ran from the mast to the traveler. This was probably only the second time I had been on my boat alone in 31 years. 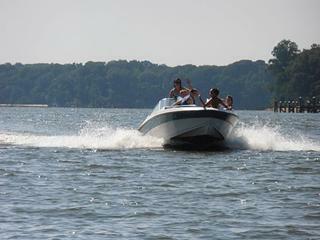 The generator in the outboard kept the battery well charged during all this motoring. I watched the GPS, snacked, and took photos to keep myself entertained. The GPS predicted that I would arrive in Chesapeake City at around 9:30 PM. I gave my wife this estimated arrival time when I talked to her on the phone in the early afternoon. My speed increased to 6.0 knots as I passed by Turkey Point Lighthouse, and I figured that the current must have been increasing. The waves were 6 inches or less all day, so they didn’t slow the boat down at all. As I approached the C&D Canal in the Elk River, I was moving at 6.7 knots, and when I passed the antennas that mark the entrance to the canal, I was doing 7.0 knots. I hit the reserve part of my 3 gallon fuel tank at 30.02 km and started to use the 6 gallon tank that I also had on the boat. The 3 gallon tank wasn’t exactly full when I started, so I don’t know my exact gas mileage, but it was certainly over 10 mpg. 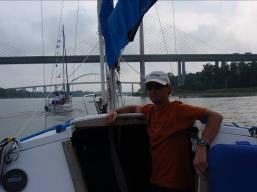 I approached the bridge at Chesapeake City which is 134 feet above the water. It can be seen for quite a distance, so I called my wife using my cell phone, and told her that I would be coming under the bridge soon. 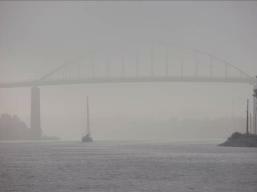 It was only 7:15 PM when I passed under the bridge. The favorable current must have cut over two hours off of the predicted arrival time that the GPS gave me earlier that afternoon. 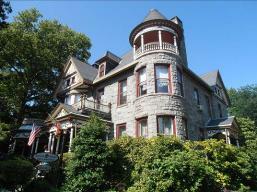 Alice said that everyone from the fleet was having dinner at the Bayard House Restaurant, which was along the canal, and just past the bridge. 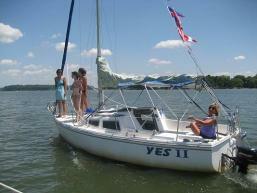 She said that she would come out to help me tie up the boat at the city dock, and that I should tie-up next to Yes II. Yes II was easy to pick out because they had their nautical signal flags run up on their boat. As I passed the restaurant, a loud cheer came from the shore. The whole fleet came out from the restaurant. I blew a vuvuzela (stadium horn) as I went past. My wife met me at the slip and help me tie-up, and went back to have her dinner which had just been served as I passed by. 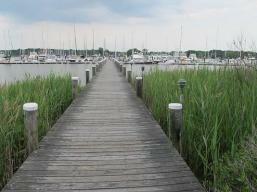 I finished tying up the boat, put in the hatchboards, and walked the short distance to the restaurant. Alice had already ordered a crab cake and steak dinner for me, which I ravenously ate as soon as I got to the restaurant. It was nice to meet the fleet and be able to finally start relaxing. They were happy to see me and were impressed that I could move the boat that far in one day, but I replied that the boat did all the work. 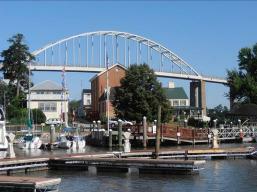 The Bridge at Chesapeake City. Alice looking toward the bridge for Key Largo. 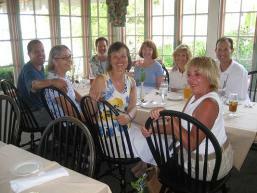 Some members of the fleet at the Bayard House Restaurant. 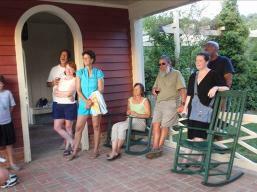 Antoinette and John at the Bayard House. 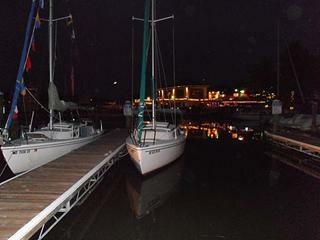 Yes II and Key Largo at Chesapeake City. 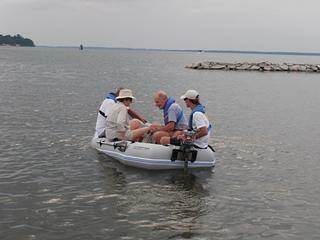 On Wednesday we motored out of the C&D Canal, back toward the Chesapeake Bay. (It isn’t legal to sail in the canal). 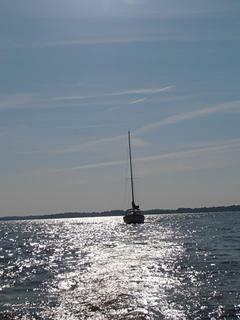 The weather was nice, but the winds were fluky and we only sailed from the canal entrance to around Turkey Point, Heather’s motor on Yes II was acting-up again, and Alice and I went back to see if there was anything we could do to help. 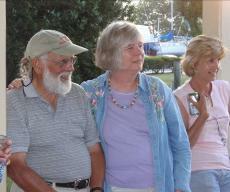 Dan, Richard, and I rebuilt the carburetor that evening in Havre de Grace. 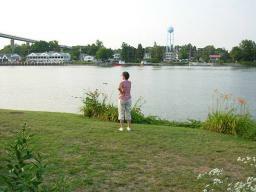 When we got to Havre de Grace, Alice and Danny toured the town on their folding bicycles. Richard and I also started out on our folding bikes, but almost immediately stopped at Havre de Grace’s Maritime Museum for about an hour. The museum was air conditioned. We especially enjoyed their old outboard motor collection, and watched part of a movie about Captain John Smith’s early exploration the Chesapeake Bay. He was actually looking for a Northwest Passage at the time. 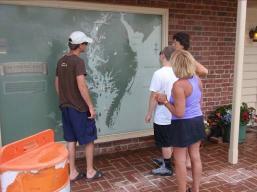 There were very many tribes of Native Americans around the Chesapeake Bay before the Europeans arrived. 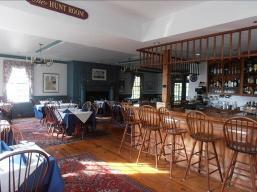 Many members of the fleet ate dinner at Price’s restaurant. 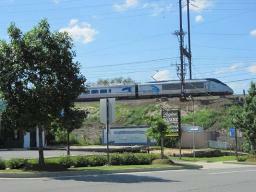 You could hear many trains passing through the town of Havre de Grace. 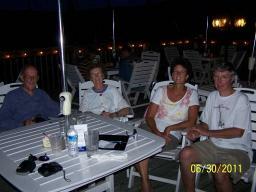 We stayed at Penn’s Beach Marina which was very nice, and a little different than most of the marinas that we usually stay at. 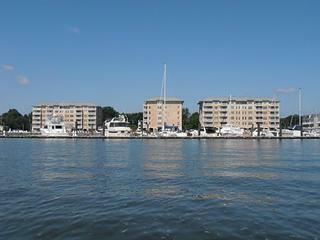 It was a marina associated with condominiums. It had a nice pool that most of the fleet members used either in the afternoon, or later that evening. 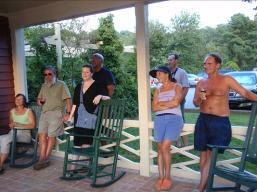 There was a fire pit near the pool and most of the he fleet gathered around it for wine after sunset. 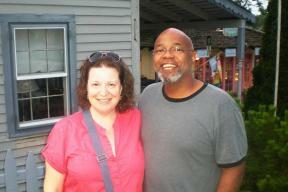 Our nephew, Austin, met us in Havre de Grace when we were having dinner. He had just returned from a wrestling camp in Florida. Austin sailed with Dan for the remainder of the cruise. 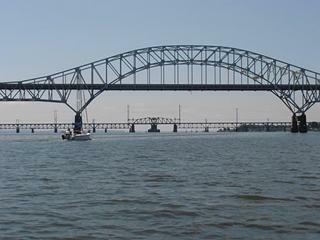 There are many bridges that cross the Susquehanna River north of Havre de Grace, including two railroad bridges, and several highway bridges, including I-95, one of the major highways between Washington, Baltimore, and Philadelphia, and New York City. 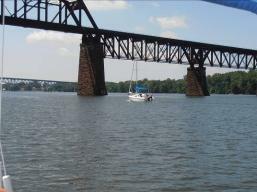 On Thursday morning, Danny and Austin motored First Draught northward on the Susquehanna River under the bridges. 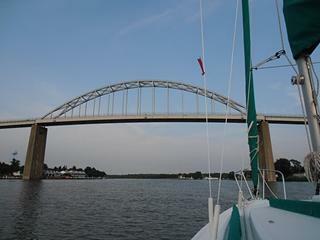 Alice and I motored Key Largo under the bridges later, to see Perryville, which is on the eastern shore of the Susquehanna River, and Port Deposit, which is further north. The scenery was a little different on the river, with the high tree lined banks. 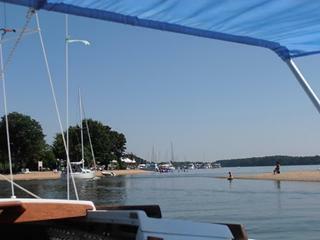 We had previously sailed our boat on the Susquehanna River near Wrightsville, Pennsylvania, when our sons were very young, and it reminded me of those times. The bottom of the river is rocky here, unlike most of the Chesapeake Bay which is soft-bottomed, so we had to pay close attention to the GPS’s charts. 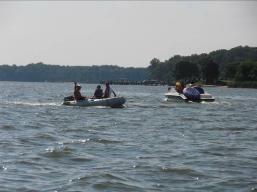 We later saw a sailboat motoring toward us and correctly assumed that it was Dan and Austin on First Draught. We motored toward them and followed them under the bridges where it didn’t appear that we had much clearance. 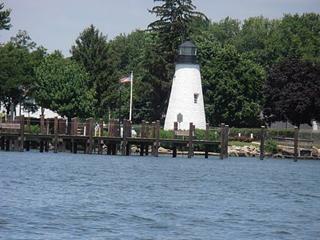 We then motored back toward Havre de Grace, then out of the narrow channel that approaches the town, and finally raised our sails to sail in the bay. 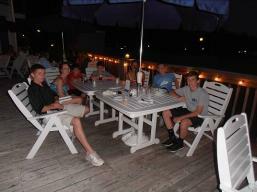 After swimming in the marina’s beautiful pool in the afternoon, we had dinner outside at the restaurant at Skipjack Cove. On Friday morning we took the fleet group photos at around 8:00 AM. I almost missed it. Heather and Carol did miss it, because they were staying at Carol’s nearby cottage. I cut-up a watermelon that they left in Dan’s cockpit overnight, which we ate around the pool for breakfast. 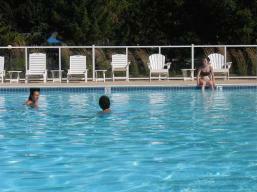 Several of the fleet members went for a morning swim in the pool. 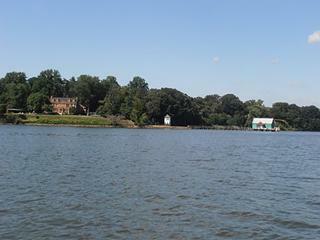 We then motored out of the Sassafras River, looking at the many nice houses that lined the banks. Dan, Grace, Alice, and Aldo. Watermelon for breakfast at Skipjack Cove Marina. 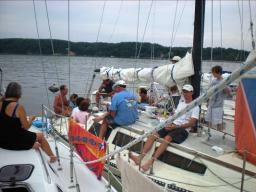 We raised the sails after the last bend in the river and sailed out into the bay past Betterton. The wind was light but the current was very cooperative and we sailed all the way to the entrance to Fairlee Creek, a distance of about 10 nm, mostly running. 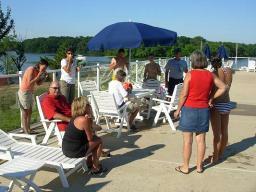 Most of the fleet members went for a swim in the marina’s pool, and many celebrated “happy hour” at the marina. We also explored the area near the very narrow entrance to Fairlee Creek. The younger members of the fleet relaxed on giant floating inflatables that were located behind Jellyfish Joel’s, a beach club. 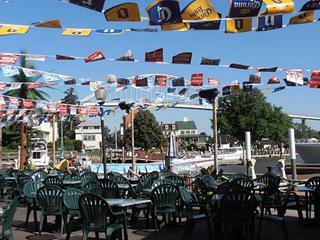 Some of the fleet members ate at the marina’s restaurant, and others ate on their boats. 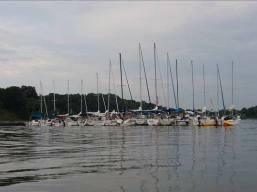 Several boats anchored out near the marina. 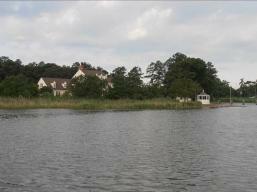 The very narrow entrance to Fairlee Creek. 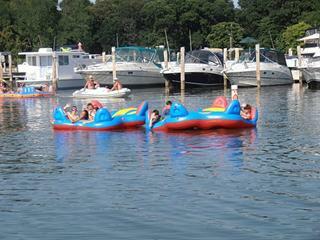 Young members of the fleet on inflatables. 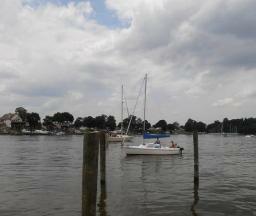 On Saturday morning, Alice and I motored across the bay to our marina on Dark Head Creek, off of Middle River. 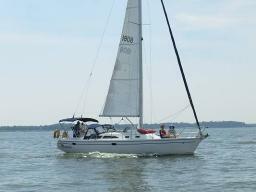 Tom A. and Gina followed on WoodWind, their Ericson 26. 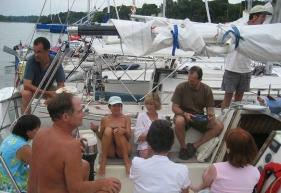 We tied Key Largo up at our marina and got onto WoodWind and got a lesson on how to start the diesel motor. 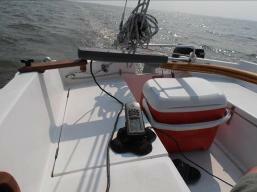 We then motored back across the bay to Rock Hall to the Sailing Emporium. We tried to sail, but there wasn’t enough wind. 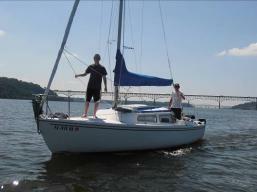 Tom and Gina sailing WoodWind for one of the last times. WoodWind following Key Largo to Middle River. 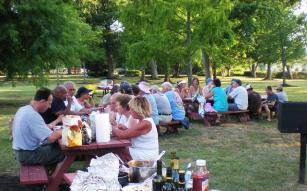 At Sailing Emporium, we had the closing picnic for this year’s cruise. 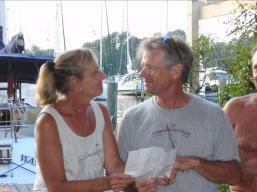 Kim and Tony also renewed their wedding vows in the same place that they got married eleven years ago, on a previous Fleet 10 cruise. Kim and Tony renewing their vows with Tom and Chris. There was some discussion about next year’s cruise, which will be the 20th anniversary cruise for Fleet 10. 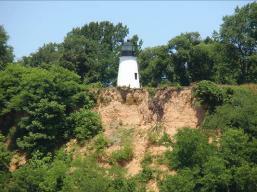 The original cruise was a circumnavigation of Kent Island. Repeating this cruise may not be adventurous enough, based on the cruises we have be having in recent years, where we frequently cover about 20 miles a day. Dan, Austin, Heather, and Alice considering next year’s cruise. 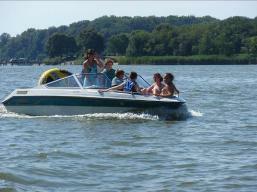 Sue and Warrick’s first cruise with our fleet. 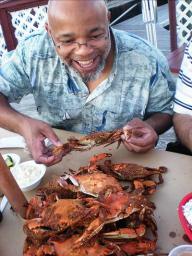 Warrick enjoying one of the Chesapeake's best meals. Chris, another long time fleet member, sailed his C-22 Paladin on this cruise for the first time in many years. 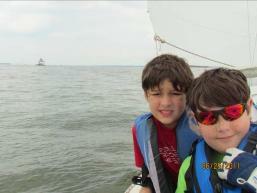 He had been busy raising his crew and they were finally old enough to sail on this cruise on his boat. 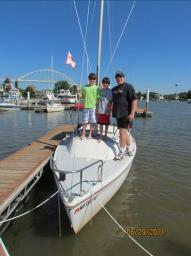 We could see that it really made Chris happy to be sailing with the fleet again, and with his sons, Conor and Ryan. 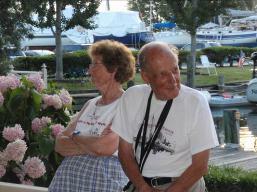 After the cruise, Alice and I sailed WoodWind back to our marina to her new slip. The wind was favorable, mostly a run, and we sailed part of the way wing on wing, and started getting used to our new boat. Danny and Austin met us there and helped us tie up. 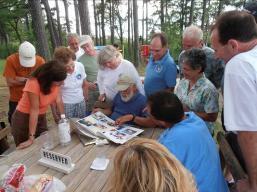 After the cruise, Richard, our fleet’s webmaster, set-up a link for us to share our photos with each other. 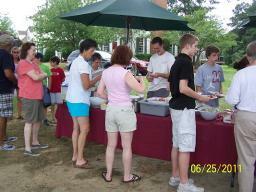 There are currently almost 1000 photos on our Google Picasa photo site. https://picasaweb.google.com/catalinaFleet10 Please be sure to click on the “Show More Albums” button to view all the photos, including mine. 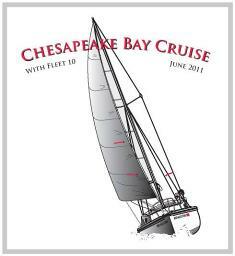 Here’s the artwork that Tony made for the t-shirts for this year’s cruise. The artwork is based on a photo that Richard took two cruises ago of Alice and me on Key Largo, when we sailed to Tangier Island in the southern Chesapeake Bay.